This blog post will guide you through all the necessary steps to recreate successful studio lighting using Canon flashguns that can be set up in almost any situation, though the same setup may be achieved with other brands in a similar fashion. Shooting in a studio or similar scenario is an excellent way to learn how light can affect your photos. These lessons can be used in any photographic situation, be it a highly controlled studio setup or shooting with natural light in an uncontrolled environment. 1) The larger the light source when compared to the subject, the softer the quality of the light that falls on the subject. This is because the larger light source wraps around the subject, softening the edge of shadows. As the light source gets smaller you’ll notice the shadow edges become more defined. Moving a large light source closer to the subject also has the effect of softening the shadows while moving the light away makes the edge of the shadow sharper and more defined. If you diffuse a light source, the light scatters and results in a softened quality as the diffuser essentially becomes the light source. For example - On a bright, sunny day the shadows are strongly defined as the light source is far away i.e. the sun. If passing clouds then block the sun, the light will soften as it becomes diffused by the clouds, thus simultaneously drawing the light source closer as the clouds now become the source. So you can look at it two ways - the hard light source is now diffused OR the light source is now very large and close. 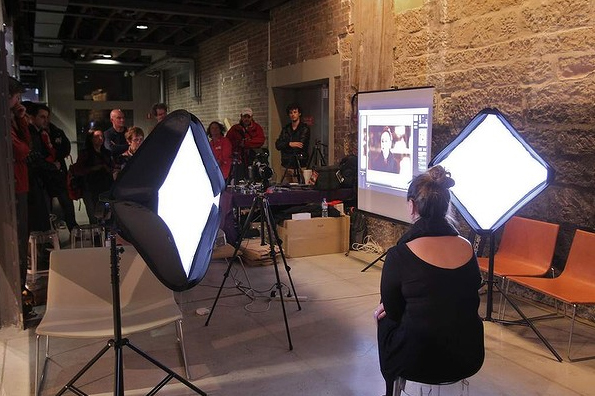 2) Bouncing a hard light source off a wall onto your subject effectively creates a larger light source. This occurs by making the wall a light source. As the wall is much larger than the size of the flash, the light also becomes a lot softer. This requires a greater power output from your flash as some light is lost from the wall and the light also has to travel further to reach the subject. Be aware of the colour of the wall as the light from your flash will change to whatever colour the wall is i.e. red wall equals red light, green wall equals green light, etc. 3) Front lighting diminishes texture, side lighting (from any direction) emphasizes texture and rear lighting highlights the shape of the subject. The direction of a light source has a big affect on the appearance of texture in an image. Lighting from the side will increase the appearance of texture on surfaces while light hitting the subject from the camera position will flatten the texture in an image. To achieve this, the light should be un-diffused as a diffused light source will soften the shadows and may even eliminate the texture. Light from behind the subject highlights the shape of the subject; a prime example of this would be a silhouette. 1) A messy background will interfere with a good portrait. That is unless the background helps to tell the story of the portrait. For example - a violinist may have a portrait taken with their violin in the background to tell the viewer more about the subject. If the background doesn’t assist the story then blur it out as much as you can with a large aperture or if possible, get rid of any distracting elements completely. There’s nothing flattering about seeing images of people with trees sprouting from their heads. 2) Have the lighting set up and the camera ready to go before your subject arrives so that they won’t have to wait for you upon arrival. 3) In portrait photography the primary area of interest and focus is almost always the eyes. As humans, that’s where we look first. Because of this it’s critical that the eyes are in focus. ​4) The direction of a subject’s eyes is also very important in a portrait. Having the subject return the gaze of the photographer can give the viewer a sense of connection with the subject. An alternative is to have your subject looking at someone or something within the shot, which sets up a story in the image. The most obvious one is a mother with her child looking at each other. If you imagine that same photo with the mother looking directly at the camera and not her baby, the image immediately shifts to a completely different vibe. ​5) Portraits are most commonly taken at the same eye level as the subject. Playing around with the angle can give a different perspective to the portrait. For example, shooting down on your subject from above, or up at them from ground level can change the viewer’s perceptions of the inherent power of the subject. ​6) Firing a number of shots at a time can either give you a series of images that work together or it can help you achieve one image that is natural. This is useful when you’re photographing somebody engaged in an activity or when working with kids. The following is a list of steps to recreate our portrait set up. In this example we used 3 Canon 600EX RT flashes, 2 60x60 Mircopro soft boxes and a Honl light shaper (for the hair light). Flash 1 is set up with the soft box at a 45 degree angle to the subject. The light in this photo is softer than a direct flash due to the soft box and off-centre position which creates a nice modelling effect upon our subject. This light is referred to as the key light or main light as it is responsible for the primary lighting effect in the shot. At this point the line between the lit part and the shadow is nice and gradual but the shadow area is quite dark. I set this flash at +1/3 exposure compensation to make the image a bit brighter. To lighten this area we require a second light from the opposite side of the subject. This light needs to be less powerful than the key light so it doesn't eliminate the modelling effect the shadow creates. I set the power of this light to half of the power of the key light and use the same soft box on it. This will lighten the shadows to even out the contrast while still keeping the shadow areas present but to a lesser degree. I set this light at -2/3 exposure compensation. Now we need to add a bit more light to the hair of our subject to create a bit of shape. For this I put a Honhl flash bender onto the third flash. I’ve put it into the shape of a snoot, which is simply a tube made to funnel light into a specific area of a photograph. In this case I want the light to fall onto the hair of our subject to highlight it and give some definition and shape to the subject. To do this I simply aim the snoot towards the subject directly from the other side of the key light. Also make sure you have a bit of height so you are shooting the light at more of a downward angle. This has created a highlight effect that helps the image to pop and adds a bit more depth. 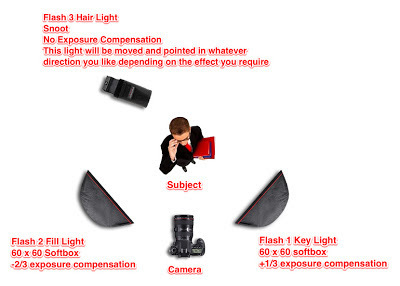 This light is set to +/-0 exposure compensation to make the highlights stand out when compared to the second flash. So there you have it. A simple, quick technique for studio lighting to get you started. Off-camera flash is a great way to begin learning about how different angles and quality of light can change the look of the subject. Once you are confident in using flash then it is easier to know how the quality of existing light will look in your photos. Using flash is also a really good way to train yourself to understand how different lighting can affect the photo you take and also trains you to identify lighting conditions and ways you can manipulate it to obtain a good result.